Compared to what I'd been through, Togo seemed liked the garden of Eden to me. Sunshine, lush jungle, green grass, waterfalls, fruits and vegetables, good food, and a wonderful beach on a very warm ocean. The people were warm and friendly, and the markets were incredible -- it seemed as though half the city were some kind of market. 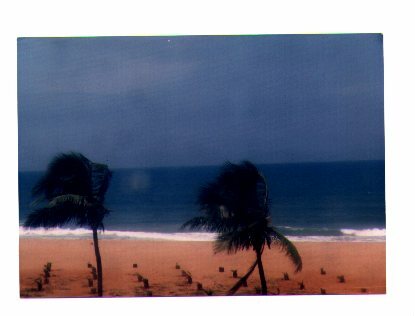 I spent a week in Togo, recuperating from the rest of my trip. 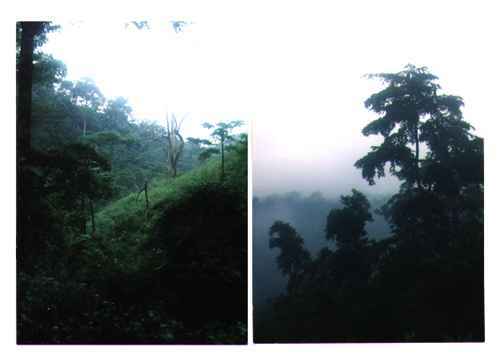 I went north, into the rain forest up in the mountains. It was so green. I went hiking in forest for a day with a local guide. 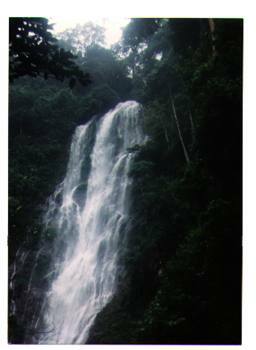 He took me to several spectacular waterfalls, which could be heard roaring in the jungle for miles. At one point, he stopped and pointed out a thin tree, maybe 20 meters high, with big green football-shaped pods hanging right off the side of the trunk. He cut one off with his machete and split it open. Inside was a white pulpy hull maybe an inch and a half thick, with big sticky-sweet brown beans or seeds in the middle, swimming in a white paste. Guess what? Chocolate.